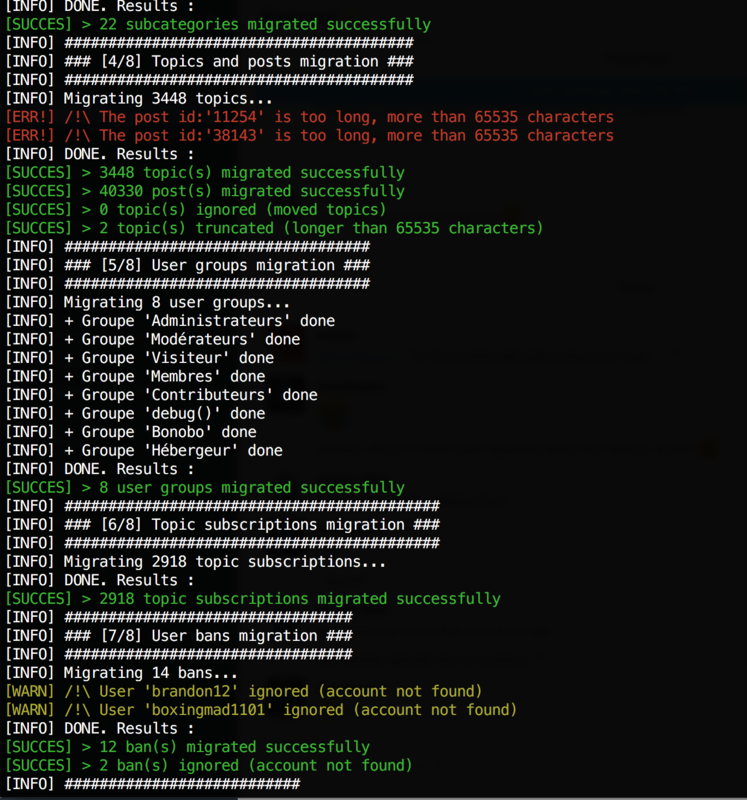 This tool exports and migrates your Fluxbb (>= v1.5.8) forum to Flarum. Private Messages are not exported yet, since this feature is not yet supported by Flarum. @tlalok and me we created this tool for a french sysadmin community called mondedie.fr (in english: my dedicated server) https://mondedie.fr/. This tool is the result of 2 weeks of work and it works pretty well with 2.5k users and 40k posts. For information, everything run Ok, after more than one hour of migration (and some fixes in source db), with more than 18.000 users and 154.000 topics. I also did a PR a couple of minutes ago about a PHP 7 missing module (tokenizer). PR merged. What have you fixes in your DB? I had to change some emails, as FluxBB allows duplicate emails which is not the case with Flarum, and I also had to change some FluxBB username as FluxBB allows diacritics — lowercase and uppercase are treated differently in FluxBB too — and some of usernames converted by the import cause duplicated. Example: "Géo", "geo" and "Geo" are 3 different valid usernames in FluxBB but they are all converted to "geo" during import. I also had 3 topics with more than 65535 characters which I have to reduce. franck-paul Indeed, the limitation of 65535 characters is no longer of actuality. I need to change this.